When we were asked to give it a test run I was more than excited! Being a huge Gumigem fan this was a dream to test and review! The latest teething item from Gumigem is the Bubba Bag! The Bubba Bag is a washable, neoprene bag containing a purse, mobile phone, credit card and car keys. 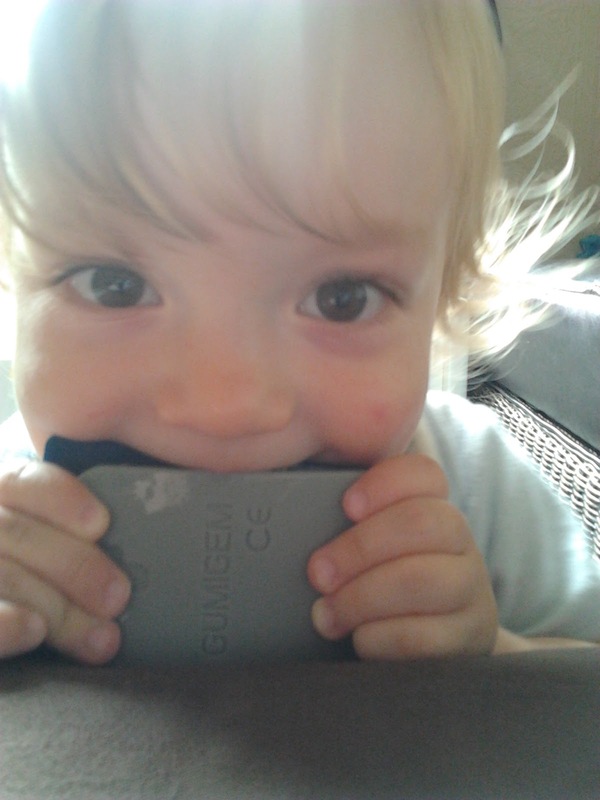 All of the teething toys are made from the same non toxic silicone that is used to make the Gumigem teething jewellery. As all parents will know, babies and toddlers are constantly putting things on their mouths. My twins particularly like my mobile telephone, keys and remote control. So when I heard that Gumigem were making teething toys designed around some of these everyday items I knew that they would be a success. As soon as I gave the twins the bags they grabbed them and toddled off to explore its contents. This lovely, soft, neat little bag sits open when placed on the floor which makes exploring its contents simple. Isabella loves walking around carrying the bag and placing toys in and out of it. 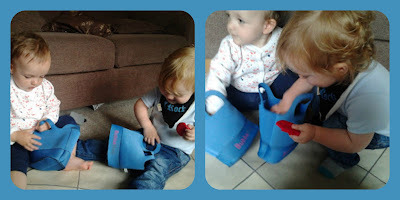 Both twins will sit and gently place the toys in and out of the bag, stopping for a good nag on them, then continuing! 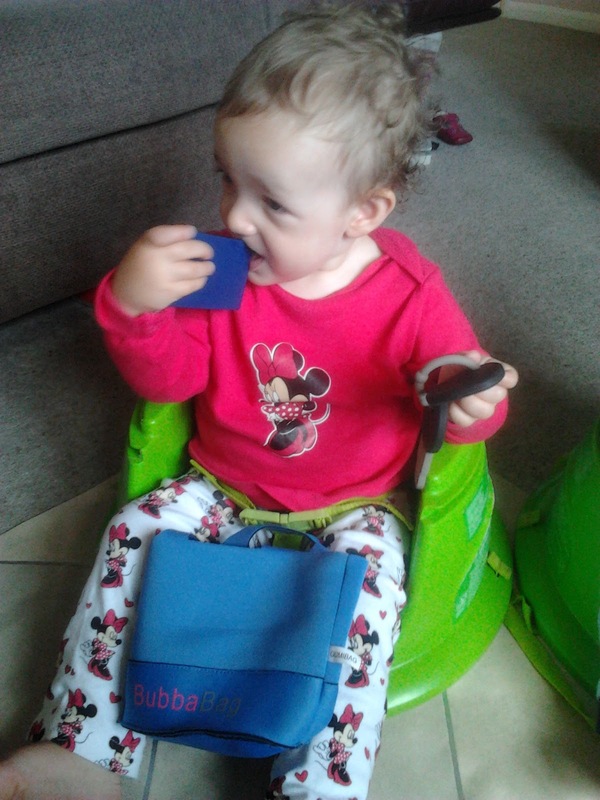 The Bubba Bag is a multi functional toy. It not only holds the teething toys but is also a great toy accessory. Isabella has even found that she can wear it as a hat! Having two teething toddlers means that they are always wanting to chew items. They have found that the car keys are ideal to get to those hard to reach molars that are coming through. The purse has lovely little bobbly bit on the top which they are always nibbling on. The credit card and mobile phone are nice and slim and we have found that they are perfect for Isabella to chew on where she has got a canine tooth trying to cut through. The mobile telephone is not only a great toy to chew on but has also provides make believe play for the twins. Isabella has had full blown telephone conversations with her grandparents! While Taylor is just happy to chew and sooth is sore gums. All of the toys have a little slit which can be used to attach onto a dummy holder to prevent them being lost when out and about. I'm sure that these bags are going to be a firm favourite way beyond teething. Priced at £19.99 plus delivery this makes the Bubba Bag an excellent value for money toy. The majority of the teething toys that we have bought in the past have become too "babyish" and the twins have quickly snubbed them. However these are so much more than your regular teething toys. 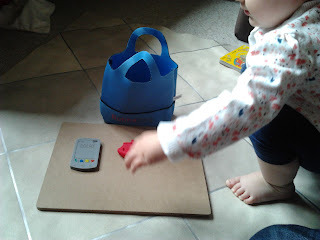 The Gumigem Bubba Bag will grow with your child﻿. It is great for small babies when they start to teeth as the toys are light weight and easy to hold. As your child grows and develops the toys go from being just teething toys to being toys that encourage imaginative play, hand and eye co-ordination and develop fine motor skills. All toys carry the CE mark and everything is suitable from 0 months except the keys which are from 10 months. 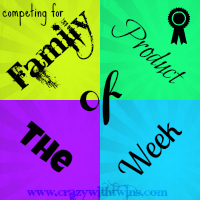 These toys get a huge thumbs up from all of us and I am intrigued and excited to see what Gumigem think of next! Visit http://www.gumigem.co.uk/ourshop/ for the Bubba Bag and their fantastic range of teething jewellery. Disclaimer: The views in this post are my honest opinions. Gumigem have not had any influence on this post. 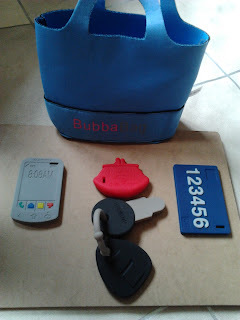 We did recieve a Bubba Bag for each of the twins to test. Fantastic! We love Gumigem too and have the very same review to do also! haha! Loving the Bubba Bag! I've done this review too! My daughter loved it!!! One of the best teething toys around.